DiNapoli, Robert J. and Morrison, Alex E. 2017. A spatiotemporal model of risk and uncertainty for Hawaiian dryland agriculture and its implications for ahupua'a community formation. Journal of Archaeological Science: Reports, Vol. 15, Issue. , p. 109. Dye, Thomas S. 2014. Wealth in old Hawai‘i: good-year economics and the rise of pristine states. Archaeology in Oceania, Vol. 49, Issue. 2, p. 59. Buck, C.E., Christen, J.A. & James, G.. 1999. BCal: an on-line Bayesian radiocarbon calibration tool. Internet Archaeology 7. Available at: http://intarch.ac.uk/journal/issue7/buck index.html (accessed 17 April 2012). Dye, T.S. 2011. The tempo of change in the leeward Kohala field system, Hawai'i Island. Rapa Nui Journal 25(2): 21–30. Field, J.S., Ladefoged, T.N. & Kirch, P.V.. 2011a. Household expansion linked to agricultural intensification during emergence of Hawaiian archaic states. Proceedings of the National Academy of Sciences of the USA 108(18): 7327-32. Field, J.S., Ladefoged, T.N., Sharp, W.D. & Kirch, P.V.. 2011b. Residential chronology, household subsistence, and the emergence of socioeconomic territories in Leeward Kohala, Hawai'i Island. Radiocarbon 53(4): 605-27. Ladefoged, T.N. & Graves, M.W.. 2006. The formation of Hawaiian territories, in Lilley, I. (ed.) An archaeology of Oceania: Australia and the Pacific Islands: 259-83. Oxford: Blackwell. Ladefoged, T.N. & Graves, M.W.. 2008. Variable development of dryland agriculture in Hawai'i: a fine-grained chronology from the Kohala Field System, Hawai'i Island. Current Anthropology 49(5): 771–802. McCoy, M.D., Ladefoged, T.N., Graves, M.W. & Stephen, J.W.. 2011. 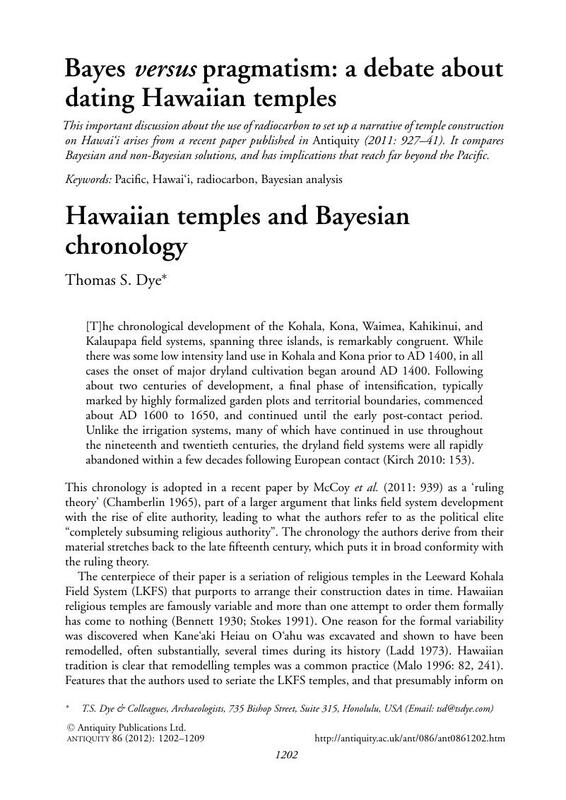 Strategies for constructing religious authority in ancient Hawai'i. Antiquity 85: 927-41. Steel, D. 2001. Bayesian statistics in radiocarbon calibration. Philosophy of Science 68(3): S153-64.